The coalition government made the decision to end compulsory work experience in 2012, a decision which some are challenging. The British Chamber of Commerce (BCC) workforce survey found that 76 per cent of 2,885 companies felt that a lack of work experience was one of the main reasons that young people were not ready for the workplace. This has led the BCC to call for a return to compulsory work experience. But are schools still using work experience placements, and how useful is work experience anyway? 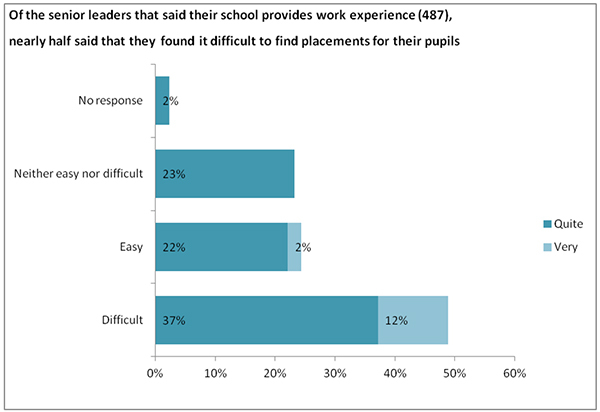 Our recent Teacher Voice survey asked 566 senior leaders a series of questions for the DfE about work experience and the results have now been published. We found that 14 per cent reported that their school did not provide work experience placements for pupils, and when schools were doing work experience, nearly half (49%) said that their school found it difficult to find placements for their pupils. There are numerous reasons why the 14 per cent of senior leaders’ schools may not be offering work experience. Many schools report barriers to setting up the placements which include: engaging employers (particularly small and medium-sized enterprises), staff time, scale and logistics of setting up the placements, and finding a wide variety of placements in different sectors (McCrone, Hopwood, Wade, and White, 2015). Around half of employers surveyed by the BCC offer work experience placements but this leaves half who currently do not. Employers are facing similar barriers to schools including cost and time, and lack of information about what is involved. They additionally reported that burdensome school requirements were also a barrier to them providing work experience placements (BCC, 2015). So how do you go about this in your school? Our NFER ‘Top tips for senior leaders in schools and colleges: How to provide meaningful experience of the world of work for young people as part of a 16 to 19 study programme’ offers practical advice on how to go about setting up good quality work experience including working in partnership with firms, preparing young people before work experience, involvement in real world projects during the experience, tailoring the experience for the student and organisation, and a dedicated team within the school developing work experience. This should help prevent photocopying being the main focus of a week out of school!